This step changing scheme will fund the future leaders of scientific research into brain tumours. Over 12 years, this scheme could provide the right researcher with up to £1.6million in funding and the support needed to set up their own lab. We have established this funding support and encourage the future leaders of scientific research in the brain tumour field. We will identify excellent early stage non-clinical researchers and provide support so they can establish themselves as leading researchers in our field. 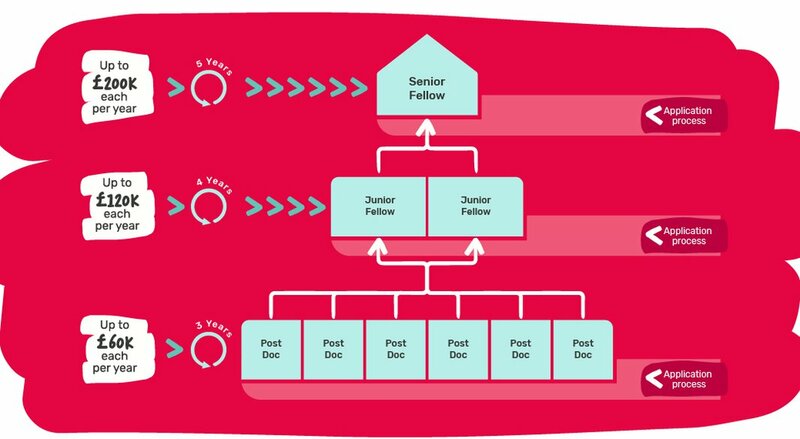 The scheme runs in three parts (Postdoctoral Fellowship, Junior Fellowship and Senior Fellowship), with only those entering the scheme as postdoctoral fellows eligible for the subsequent grants. Up to six postdoctoral fellowships will be awarded, for an investment of up to £60,000 each per year for three years. The initial application is to be made by a strong mentor who will guide them through this initial term. After three years these postdoctoral fellows will be invited to submit an application for a four year Junior Fellowship, totalling up to £480,000, to support themselves and a research associate in a host laboratory. During this time, fellows should develop as independent researchers and begin to build their own groups. In the third stage of funding, successful fellows will be invited to apply for a five year Senior Fellowship, totalling up to £1million, to support the applicant and a small research group. This senior post MUST be at a UK university or institution. We encourage a change in host institution and mentor at each stage to facilitate the applicant’s development into a fully independent group leader. All rounds will be competitively assessed and applicants will be interviewed, either in person or via video conferencing. To obtain input from those affected by brain tumours, we strongly recommend that applicants access our Research Involvement Network (RIN) for public and patient involvement. In order to receive feedback from the RIN, please allow for a minimum of three weeks turnaround time. All grant applications must focus on at least one of the research priorities highlighted in our Research Strategy 'A Cure Can't Wait'. The named postdoctoral fellow must, at the date of the call deadline, be in possession of a doctoral degree. Clinicians moving into full time laboratory based research are welcome to apply, providing they also have a PhD. The named postdoctoral fellow's previous research need not be in the brain tumour field, but they must be able to demonstrate how they will apply their prior learning to the study of brain tumours. The Mentor must hold an employment contract beyond the period of the grant. The Host Institution should provide additional transferable skills training to the fellow, such as planning and writing of publications, project management, supervision of junior lab members and presentations in conferences and to the general public. This scheme is initially open to international researchers. However, Senior Fellowships must be taken up at a UK university or institute. The fellow must be appropriately trained and be able to demonstrate a strong track record in scientific research. The fellow should be well suited to carry out the planned studies. Applications must contribute to the development of the fellow, allowing them to reach a position of professional maturity and independence. At all application stages, fellows must evidence their willingness to relocate to the UK to take up a Senior Fellowship. Mentors must be well positioned to provide fellows with appropriate training, supervision and mentoring to help them establish themselves as independent researchers. There should be identifiable programmes for personal development at the Host Institutions that fellow can be enrolled upon. Projects must have a sound approach and methodology in order to address the questions raised while exposing the fellow to different techniques. Applications should demonstrate a potential pathway for the research to lead to patient benefit and the anticipated impact of this. Applications with a clear path to clinical application will be strongly favoured. Applicants should justify how the requested funds are essential for the work and explain how the project represents value for money. Leveraging matching funding from other organisations will be favoured. To apply for the Future Leaders grant, please click the button below and complete the application process.